LILLIAN, Ala., May 22  The last stop on the Florida greyhound racing circuit was supposed to be the Pensacola dog track, where over-the-hill racers hustled after the mechanical rabbit one last time. But for dogs that could not keep up the pace, the authorities say, it turns out that the end of the line would often be across Perdido Bay, in a dusty corner of Alabama, in a ditch behind the ramshackle home of one Robert L. Rhodes. Here, on an 18-acre spread strewn with rusty trailers, filthy sheds, steel animal traps and a small menagerie of hogs, cows and billy goats, Mr. Rhodes routinely disposed of used-up greyhounds with a bullet to the brain, prosecutors say. Judging from aerial photos of mounds of bones, Mr. Rhodes's own admissions, and the number of dog carcasses unearthed on Tuesday in just one pit, investigators say they believe Mr. Rhodes slaughtered 1,000 to 3,000 dogs over the last 10 years. Mr. Rhodes, 68, a former security guard at the Pensacola Greyhound Track, told law enforcement officials and local reporters on Tuesday that he had killed the dogs for $10 each, and that he had been doing it his entire adult life, beginning with his first job out of high school as a young man in the Black Hills of South Dakota. Today, Mr. Rhodes was charged with three counts of animal cruelty, a felony punishable by up to 10 years in prison. Mr. Rhodes insisted that he always shot dogs once in the brain. "It was quick," he told The Pensacola News Journal. "They didn't feel a thing." But District Attorney David Whetstone said three of the four dogs his investigators dug up on Tuesday had been shot in the mouth or the neck. "None would have died instantly," he said. The discovery of Mr. Rhodes's animal-disposal operation exposed what animal-rights advocates have long described as the lethal underbelly of the waning greyhound racing and parimutuel industry in the United States, in which as many as 34,000 puppies are born a year and 24,000 dogs registered to race on any of 48 tracks in 15 states. "We know there are many animals produced for racing, and that the industry does not have sanctuaries or shelters to place animals that are no longer useful to them on the racetrack," said Wayne Pacelle, senior vice president of the Humane Society of the United States. "They're doing something with them. The information we've had over the years is that they are killing them, disposing of them. They are raised for commercial purposes and when they don't produce, they are expendable." Advocates recalled similar cases in the United States, but none involving as many dogs. Last year, an Iowa breeder was charged with collecting 341 greyhounds for adoption but then selling them to a medical research laboratory. Last month, international animal-rights advocates charged that thousands of greyhounds were being put to death in Spain, often by hanging, at the end of the racing season. Gary Guccione, executive director of the National Greyhound Association in Abilene, Kan., said that adoption is strongly encouraged, and that 18,000 dogs are adopted each year. But euthanizing healthy dogs merely because they do not run fast enough is not forbidden, he said, provided it is done humanely  by lethal injection. Indeed, neither Alabama nor Florida state law prevents the owner of an animal or pet from killing it for any reason at all, provided the killing is done by lethal injection, officials said. But most veterinarians refuse to kill healthy animals, officials said, which apparently opened a niche for Mr. Rhodes. The trail that led to his property here in Lillian began in April with an anonymous tip to Albert Kelson, the racing director at the Pensacola track, about dogs being shipped off by the truckload, often under cover of darkness. In an interview, Mr. Kelson said only one kennel associated with the track, owned by Clarence Ray Patterson of Pensacola, was giving dogs to Mr. Rhodes to be killed. He said that Mr. Rhodes was a part-time security guard at the track for two or three years, and that other guards were concealing his visits to the greyhound compound by not signing him in. Mr. Kelson said that Mr. Rhodes and the other guards were fired on May 9 or 10. Mr. Patterson, whose contract was terminated by the track, could not be reached for comment. Mr. Whetstone, the Baldwin County district attorney, said Mr. Rhodes had been running an animal-disposal business, in which he picked up roadkill and dead farm animals like cows and horses, butchered them, then fed the meat to his own dogs and left the carcasses to his hogs  all in flagrant violation of health codes intended to prevent the spread of bovine diseases. He said investigators dug into one pit on Tuesday and found 40 freshly killed greyhounds, with the tattooed identification numbers still visible on their ears. Mr. Whetstone said he had been to the dog track and enjoyed the races, but after seeing Mr. Rhodes's property he sounded more like an animal-rights advocate, likening it to a "Dachau for dogs." "We've seen this before," Mr. Whetstone said. "A madman called Hitler was doing it, trying to create a superrace. Well, they're overbreeding, because they're trying to get superdogs. These dogs were not unhealthy, they were just slow." Tonight, as Mr. Rhodes awaited a bond hearing, his property and his live animals were left to themselves. Past his trailer, where a phone inside rang steadily, past the sheds where about a dozen surviving greyhounds stirred in their cages at a visitor's footsteps, past the gate that kept 22 goats from running free, a field opened wide before a piny woods. Off to the right were what looked to be half a dozen sand traps. But up close, the sand revealed bits and pieces of animal bones. In one, the dirt was fresh, the bones were not yet bleached white, and the stench was still drawing swarms of giant flies. 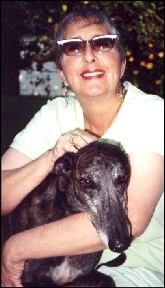 Site author with her 3rd rescued greyhound, Chenille. She adopted her first retired racer in 1978. "Greyhounds live to be loved. They are wonderful, sweet and gentle."